These winning brownie cupcakes will disappear faster than a quarterback blitz. Preheat oven to 350°F (175°C). Line 2 1/2-inch muffin cups with paper or foil bake cups. Place butter in large microwave-safe bowl. Microwave at HIGH (100%) 1 1/2 minutes or until melted. Add cocoa; stir until smooth. Add brown sugar and granulated sugar; stir until well blended. Add eggs and vanilla; beat well. Add flour and 1 cup pecans; stir until well blended. 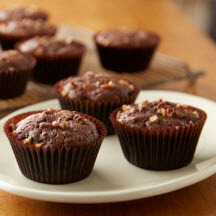 Fill prepared muffin cups about 3/4 full with batter; sprinkle 1 teaspoon remaining nuts over top of each. Bake 20 to 25 minutes or until tops are beginning to dry and crack on top. Cool completely in cups on wire rack.